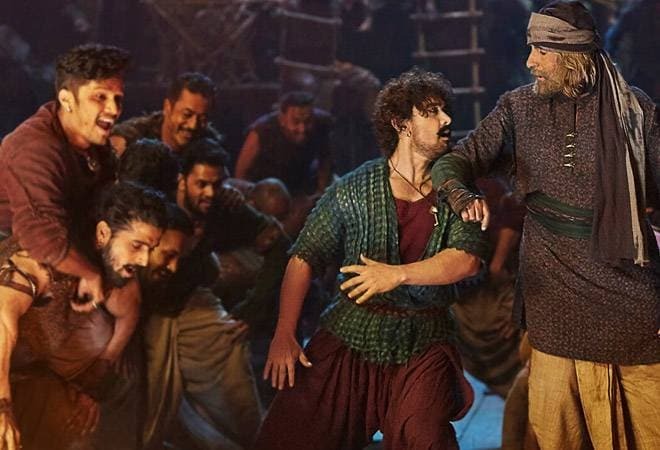 With Thugs of Hindostan scheduled to be released on November 8, industry experts believe that the next Yash Raj Films offering could earn up to Rs 50 crore on its opening day. The hype around Thugs of Hindostan has been building for quite some time now and it can very well get an opening day collection to match it, experts believe. The period film starring Aamir Khan, Amitabh Bachchan, Katrina Kaif and Fatima Sana Seikh will be the biggest Bollywood release of this year in terms of number of screens. Scheduled to be released a day after Diwali, trade analysts expect the film to bring in up to Rs 50 crore on its first day at the box office. The advance bookings for the first day tickets of Thugs of Hindostan are open and around two lakh tickets have already been sold, said a report by Box Office India. This surpasses advance ticket booking numbers of Tiger Zinda Hai, Sanju and Avengers: Infinity War, the report adds. Trade analysts believe that the stellar star cast of Thugs of Hindostan will be able to draw crowds to the theatres, despite the mixed reaction to the film's trailer. "If you look at the overall scenario, there is Aamir Khan, there is Amitabh Bachchan, there is Katrina Kaif, there is Yash Raj Films backing it, there is a scale, there is a spectacle value, it will be one of the biggest big screen appearances to come out of Hindi cinema and irrespective of the negative reviews of its trailer, I really think that the audience, at the ground level, will come out in big numbers and watch it," film exhibitor Akshaye Rathi told Times Now. Bollywood business expert Taran Adarsh also believes that the Thugs of Hindostan will be able to rake in Rs 50 crore on its opening day. "The screen count is going to be massive, ticket rates have been enhanced and moreover, it's the coming together of Yash Raj Films, Aamir Khan and Amitabh Bachchan," Adarsh was quoted as saying by Bollywood Hungama. Yash Raj Films has issued instructions to film exhibitors to price Thugs of Hindostan tickets ten per cent higher than that of Rajkumar Hirani's Sanju (in multiplexes) and Remo D'Souza's Race 3 (in single screen theatres), according to a Bollywood Hungama report. These were two highest grossing films of this year. The ticket prices will reportedly begin from around Rs 400 to Rs 1,500 in the premium multiplexes. Whereas, the single screen theatres may see the average price go up to Rs 200. The high cost of producing Thugs of Hindostan has been cited as the reason to justify the increase in ticket prices. The Vijay Krishna Acharya directorial was made with an estimated budget of Rs 300 crore. Reacting on the increase in ticket prices of, Aamir Khan said, "I can understand. It is an expensive film. Personally, I am always for tickets to be cheaper. I think we should have theatres that are economical and people should go and watch the film in theatre. It is my dream that in India you should have theatres that are economical, middle group and posh. Everyone should have the opportunity to access the film and I hope that happens."